In brief: Are the Reds worse than the Nats? 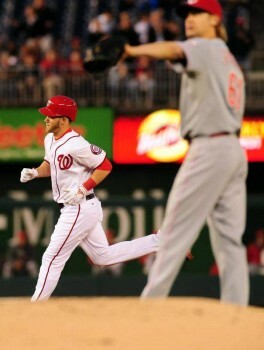 The Reds began a visit with the Washington Nationals on the wrong foot yesterday, losing 1-8. They left Bronson Arroyo out there for 6.0 innings, even though the 6 runs (5 earned) he allowed came in the second and third innings. I guess they figured there was plenty of time to make it up? But that would require the offense to be present, and the Reds offense has been away on holiday lately. The Reds’ only run came from a solo shot by Joey Votto in the fourth inning. Hell, that was the Reds’ only HIT. Also, the Reds had two errors. Blerg. Tonight Homer Bailey (RHP, 1-1, 3.24 ERA) tries to make up for the disastrophe that was last night’s game when he faces off against Jordan Zimmermann (RHP, 3-1, 2.67 ERA). Bailey is coming off a no-decision against the Marlins last Sunday, while Zimmermann’s coming off a loss to the Mets. A bad day? Or something more? I didn’t have the stomach to watch most of last night’s game for myself. It’s just too eerie to hear cheers going up for those guys in the doppelganger uniforms at exactly the opposite times as when I would cheer. It’s like slipping into a parallel dimension or something. But I did see some, and I wondered whether this was really just a combination of Badroyo making an appearance, the offense playing hide-and-seek, and the defense having a bad day. Could it really be a perfect storm, or are the Nationals just a superior team? After all, they do have a barely-legal who’s hitting better than Votto (OBP’s not even close, but we all know Votto’s not paid to get on base) and they were picked by ESPN to win the World Series this year. On the other hand, the Nats were under .500 coming in to this series (10-11), and the Reds can take credit for pinning 2 of those losses on the Nationals in the first week of the season. And though the season record between these two teams is now even, the Reds still outscored them 28-18 in the four games they’ve played so far. Also, it’s April. Of the last 12 times the Reds have played the Nationals, 5 of the games went into extras. Comments Off on In brief: Are the Reds worse than the Nats? Bronson Arroyo waits for a new ball after Bryce Harper lost one in the seats. 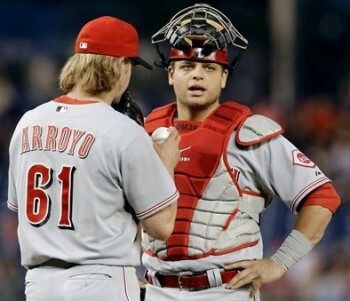 It took until the fifth start of the 2013 season, but Bronson Arroyo’s evil, incompetent twin Badrroyo finally made his first appearance. Arroyo pitched six innings, allowing nine hits, six runs–five earned, while striking out two. It was a bad performance that the Reds’ offense had no hope of overcoming. The Reds scored just one run, and that was thanks to a solo home run by Joey Votto in the fourth inning off Washington Nationals starter Gio Gonzalez. Gonzalez was on top of his game, though, as that was the only hit he allowed over his eight innings of work. I wonder if Votto will be criticized for hitting a “wasted” home run. It’s probably not something he’s paid to do. Arroyo was bad and the offense was bad, what else? The bullpen didn’t help matters much. JJ Hoover contributed a scoreless inning, which is nice to see. He’s been a lot more effective now that he’s not being called on to pitch every game. But Logan Ondrusek had a bad outing in the eight, allowing the Nationals to score two more runs. Other than that, he’s been much improved since returning to the majors this year. Today the Reds will go again for their second road victory of the season. That’s right. They’ve won just one road game so far, having an away record of 1-6. They’ll hope for better luck tonight when Homer Bailey goes against Jordan Zimmerman at 7:05pm.